27-5-2017 న చికాగో దగ్గరలోని షాంపేన్ హిందూ టెంపుల్ లో 'లలితా సహస్ర నామములు - శ్రీచక్రము' అనే అంశం పైన మాట్లాడబోతున్నాను. దానికి సంబంధించి అక్కడున్న ఇండియన్ సర్కిల్స్ లో సర్కులేట్ చెయ్యబడిన సమాచారాన్ని ఇక్కడ చూడవచ్చు. Sri Satyanaryana Sarma garu worships and follows the divine teachings of Lord Sri Ramakrishna, Ramana Maharshi and Jillelamudi Amma. He holds the unique fortune of receiving the grace of Spiritual Masters like Swami Nandananda, Swami Tapasyananda and Swami Gambhirananda. Sri Satyanarayana Sarma garu is a great communicator with deep practical knowledge of Vedanta, Yoga and Tantra. 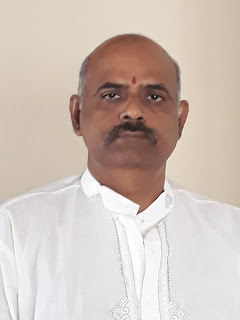 Sri Satyanarayana Sarma garu has also acquired mastery in estoric arts like astrology, alternative medicine and martial arts and leads Panchawati Spiritual Foundation in India (www.mapanchawati.org) and USA (www.usapanchawati.org). He wrote and published books in Telugu viz,. "Tara Stotram" and "Sri Vidya Rahasyam" ( e-book and print). His Telugu book "Sri Lalitha Sahasra Nama Rahasyardha Pradipaka" (e-book and print) will be released in May 2017.